Presentation: Shipwrecks of New Jersey by Margaret Buchholz, noted author and expert on Atlantic coastal history, takes us on a gripping 350-year voyage through the “Graveyard of the Atlantic” — a name bestowed upon the state’s treacherous shoals and inlets. Open Forum: The Mystery and History of Genuine Sea Glass Panel discussion with sea glass experts and serious collectors Mary Beth Beuke, Jeanie Hood, Jenna Perfetti, Maryann Wadiak, and moderated by Cape May’s own Darlene Eldridge. 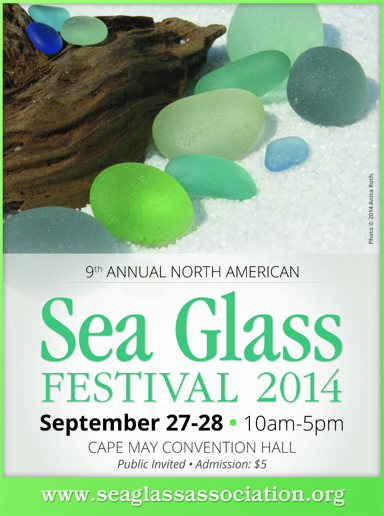 Bring all of your sea glass questions for the panel. Presentation: The Sea Glass Center and Traveling Sea Glass Museum by Danielle Perrault. Join Danielle Perreault, Executive Director of The Sea Glass Center Kennebunkport, Maine as she reveals images of natural and man-made sea glass taken from a scanning electron microscope at The University of Southern Maine. On Sunday, the Festival’s premiere event, the Shard of the Year Contest, awards up to $2,000 in cash prizes for the most pristine and unusual shards of genuine sea glass and other found objects. The festival is six short weeks away – see you then!